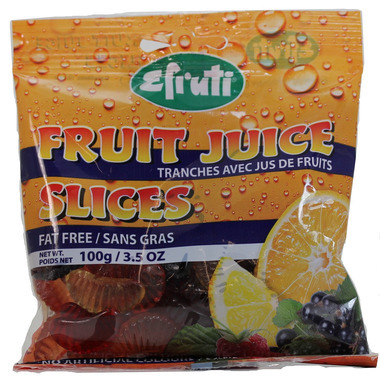 Efruti Fruit Juice Slices are made with real fruit juice, are free of any artificial colours, and are fat free! Ingredients: Glucose Syrup, Sugar, Gelatine, Fruit Juice Concentrates (lemon, orange, raspberry, blackcurrant), acidulant: citric acid, colours: beetroot red, caramel sugar syrup, flavourings, vegetable oil, glazing agents: beeswax, carnauba wax. Added these in a gift parcel to my daughter. She loved them and said they were so good that she could easily have eaten the whole bag at once. Another great tasting product from this company. My son REALLY likes them! Finally something good for my tommy and my mind! The taste is perfect and not to sugary: children will love them, but you too!